The object of the game is to defeat Neanderthals with two caveman ninja heroes along with dinosaurs and huge level bosses. Each player controls either Joe or Mac with limited lives and continues. If the player cannot defeat the game using those lives and continues, the game starts at the very beginning. Players can also choose to fall in love with a girlfriend in their Stone Age village; giving her flowers and meat as presents. Once the player gets married, he gets to father a child. Stone wheels are the official currency in the game and players can replay levels in order to get more stone wheels. An overhead free roam map offers a chance for players to select their level like they were playing a console role-playing game. Only one of the levels took place in a tropical environment; causing gamers to question the "Lost in the Tropics" in the title screen. A caveman named Gork has stolen the crown belonging to the Chief of Kali Village, and it's up to the player to retrieve it by using the seven rainbow stones that he will receive in the story." 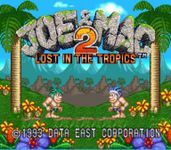 Source: Wikipedia, "Joe_&_Mac_2:_Lost_in_the_Tropics," available under the CC-BY-SA License.